When you have a loved one who needs care, family members usually step in to help, but it’s more difficult when there’s a need for 24-hour care. Family members don’t usually have those types of caregiving skills and it’s difficult juggling round the clock care with a job and other family duties. Luckily there’s another option besides moving into a nursing home for families with members who need this type care. Assisting Hands Home Care provides 24-hour in-home care for clients in Des Plaines, IL to help seniors and clients with disabilities stay in the privacy and comfort of their own homes. Our services are perfect for clients who are dealing with limited mobility due to injury or illness, dementia or Alzheimer’s diagnoses, people recovering from surgeries or illnesses, and hospice patients. Our staff members are fully screened before we hire them and are trained in CPR, first aid, and dementia/Alzheimer’s care so you can be sure your loved one is receiving compassionate, quality care, day and night. Our staff will make sure they’re safe and comfortable and provide the excellent level of care they deserve. 24 Hour Care. We can provide round the clock care and companionship for clients in Des Plaines, IL who need assistance after a wide variety of diagnoses. We’ll help them stay in their homes for as long as they can and help them with a variety of daily tasks. A staff of three caregivers are assigned to each client who work in shifts, ensuring that someone is always alert and ready to provide immediate assistance at a moment’s notice. Overnight Care. Family members may be able to help a loved one during the day but juggling their own families and work schedules can make providing overnight care difficult. We can help by taking the overnight shift, ensuring there are no lapses in care coverage. Live-In Care. In many cases, the situation isn’t serious enough to require 24-hour care but having someone in the home with a senior family member would be reassuring to everyone. Assisting Hands Home Care can provide aides who will stay with your loved one in their home in case of emergency but will sleep at night. A loved one who needs 24-hour care is stressful on everyone involved, especially if family members don’t live nearby. 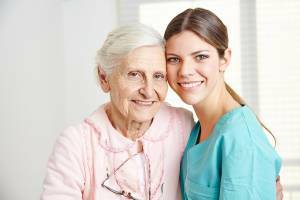 Providing that care is difficult, especially during the overnight hours, so call the care coordinators at Assisting Hands Home Care to learn how we can help clients in Des Plaines, IL manage in home care issues with their families. For more information, contact us at (847) 915-6186. We engage our clients in meaningful conversations and fun activities like cards and puzzles that keep their minds engaged and alert. We can also provide more intensive care, including 24 hour and live in care. No matter what type of non-medical assistance your family needs, Assisting Hands Home Care is ready to help.